Robert Herjavec -- one of the deep-pocketed investors on "Shark Tank" -- slammed his ultra-fast $350K Ferrari into a wall at 130 MPH ... and TMZ has the glass-shattering dash cam footage. It all went down this weekend during the Ferrari Challenge at the Infineon Raceway in Sonoma, CA ... where Robert was racing his 2011 Ferrari 458 against other rich guys in really expensive cars. 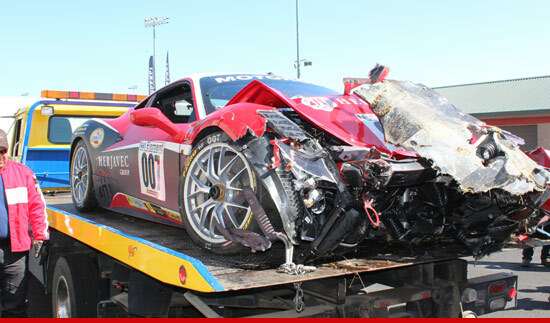 Herjavec tells TMZ, "I crashed in qualifying -- bad and hard hit." "I was having an amazing lap very fast, just off the course record, and then just thought I could go a little faster (what race car driver doesn’t?)." Herjavec -- who's reportedly worth more than $100 MILLION -- lost control and crashed into a wall ... crushing the front of his car like a soda can. But Herjavec -- who miraculously didn't suffer any serious injuries -- didn't pull out of the race. Instead, he got ANOTHER Ferrari and pressed on. "After the crash I went out and borrowed a friend’s car (good to have friends that lend you a $ 350K car) and 2 hours later I started in 29th and finished 5th. The next day, in the borrowed car, I got on the podium and finished 3rd ! Still leading in the points for the season." LAPD Officer: Why the Hell Are You Driving Kim Kardashian's Ferrari? ?